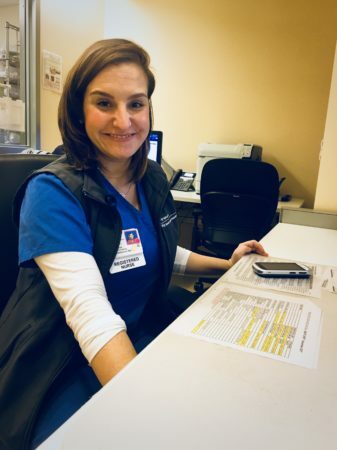 Natalie began her nursing career as an inpatient pediatric psychiatric Registered Nurse at John Muir Medical Center‘s Behavioral Health Center. She also has a degree in Developmental Health Science and a Master’s degree in Clinical Nurse Leadership. She currently also works as a pediatric medical-surgical nurse at UCSF Benioff Children’s Hospital. Yep, two separate nursing jobs with dynamically different patient populations. 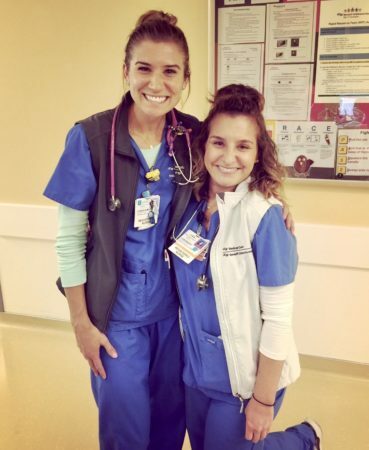 Natalie is the epitome of a hustler – leveraging the flexibility of nursing to maximize her time, learning, and career potential. When did you realize you wanted to be a nurse? I come from a huge family of both nurses and first responders! I remember my cousin graduating from Nursing School when I was about 12 years old. From that time on, I had always debated between becoming a teacher or a nurse. I knew that whatever I did, I wanted to work with children. It wasn’t until I started college and began coaching cheerleading and gymnastics at the high school level that I finally made my mind up about nursing. I realized that nurses wear many hats including teaching, so taking the nursing path allowed me to do both! Do you feel like your two jobs complement or supplement each other? They absolutely complement each other! No matter which population I am working with, I inherently bring both sets of skills with me. It’s nearly impossible to silo them. When caring for an individual, we as healthcare providers are responsible for the whole person. For example, if we were to admit a patient onto a Med-Surg floor who broke a bone, we wouldn’t just repair the break and ignore the emotional toll that the break had on the patient. My first love is education and sharing my knowledge with anyone who is willing to learn! I love that I get to share my knowledge with coworkers who may not have had the same experiences that I have had. Do you feel like having two different nursing jobs helps to prevent burnout in either one of them? Absolutely! Personally, when I start to feel that I am getting burnt out with anything in life, I will take a break in order to rejuvenate. I’ve found that working in two separate fields has allowed me to maintain appropriate boundaries in both positions. I have a type-A personality and have learned how to not “stress the small stuff.” Working two different jobs allows me to focus on the “bigger picture” and remember what is actually important in each. This prevents me from getting too caught up in unnecessary details of each position and keeps me centered. What’s the most difficult aspect of working two different nursing jobs? I would say that logistically, having two different jobs is not difficult. I am incredibly lucky that as a Med-Surg nurse I only work three days a week and my position as a psychiatric nurse is incredibly flexible. The flexibility is what allows me to continue to work at both facilities with ease. There are a couple difficult aspects to having the two jobs that I do have. The initial transition from Psych to Med-Surg was a lot harder than I expected, going from being an expert in one particular field to a beginner in another. It was such a blow to my ego! 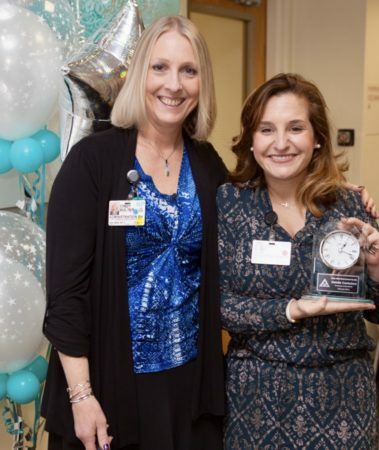 I had worked my way to the top as a psych nurse and developed a lot of confidence in my role, but I still had to prove myself as a newly hired Med-Surg nurse. Whenever I made a basic mistake or didn’t know the answer, I desperately wanted to remind my preceptor of all the accolades I had acquired at my previous position (as if that would somehow make up for the error I had just made). But, I knew nobody wanted to hear how great I was “at my other job.” They were interested in how I was doing here, right now. I realized that even though I was bringing a vast amount of psych knowledge with me to this new position, I was essentially starting over, from scratch. And in a way, I’m glad I didn’t realize how difficult that transition was going to be for me- I would hate for it to have deterred my decision to start such a wonderful new adventure! Another difficult aspect is realizing that people are not as comfortable working with the psychiatric population as I had initially thought. Because my first job out of nursing school was working in psych, I had always assumed that all healthcare providers were well-versed in caring for this particular population. However, there is still a lot of stigma around mental health. We don’t see as many of these patients in the Med-Surg world, and as a whole, we lack an adequate understanding of the pathophysiology around mental health disorders. We sometimes struggle with how to best care for psychiatric patients in the Med-Surg setting. The diagnosis and management of psychiatric disorders are not as tangible as other diseases; they aren’t diagnosed with a simple blood test or scan. Yet, they each have a very specific disease process that is quite manageable with appropriate treatment. Caring for individual patients in this population is challenging because the treatment is heavily based on behaviors and interactions. We emphasize boundaries and consistency, both of which are really the backbone of how we manage all mental health disorders. Though all of the skills I have acquired in psych are widely accepted and evidence based, nurses can be quite resistant to many of them, including the use of restraints and psychiatric medications. I have been approached on several occasions by coworkers who don’t believe in these approaches. Some have gone as far as name calling or insulting my suggestions. It’s really forced me to develop thick skin around this topic. I continue to remind myself that most people are very naïve to this subject simply because of lack of experience – they haven’t had the opportunity to see how successful we are with the use of these interventions (and why research supports this). At the end of the day, that is something that I would love to provide more education on! I always try to remember that my good days still outweigh the really bad, hard days and remind myself that there is nothing else I would want to do with my career! It’s vital to understand that you can’t have the good without the bad- it’s a package deal. However, that doesn’t make the really bad days less hard. It’s all about self-care! I think it’s important to figure out what works for you and make it a part of your daily habits, which takes constant reflection! I am always examining what I can do differently in order to cope better. I am still thrown curveballs and don’t always know how to deal with everything, but early on I figured out how to find support when I need it. For example, as a psych nurse I took care of patients who had been through some pretty traumatic experiences. I learned that when I started to feel overwhelmed by some of the stories I had heard, I knew it was time to talk to a therapist. I still meet with a therapist regularly to make sure that I am coping appropriately based on my experiences. I think that when working specifically in pediatrics, tragedy becomes the norm. It is a part of our everyday life and somehow we become tolerant of it. It’s important to take a step back every now and then and realize that just because we see it every day, doesn’t necessarily mean that we are coping well with it. What advice would you give a nurse that has a full-time job that’s looking to try something else also? Go for it! You will only regret not doing it! Transitioning into pediatric med-surg was the best thing I ever did. I love being a psych nurse and I treasure the skills I have acquired while working in psych, but my true love will always be pediatric med-surg! I am competitive, organized and often refer to myself as a self-proclaimed perfectionist! When at work, these are the traits that help me aim to provide quality care to my patients. Also, I really enjoy connecting with others and building a positive rapport with those around me. I am constantly striving to bring this positive energy to work with me, in hopes that it will rub off on both my patients and coworkers! I wish others knew that it takes a tremendous amount of vulnerability and responsibility. Not only to put yourself out there emotionally and care for sick kids, but I think people don’t realize just how much we are on the front lines. We don’t have doctors attached to our hips. Or nursing assistants. Or even pharmacists. There are several times throughout the day where nurses have to think critically and quickly, as there isn’t always time to sit and wait for the right answer. It takes courage to advocate for your patient, especially when you are in a room filled with some of the most brilliant minded doctors in the nation, literally. Nursing, just like medicine, is constantly changing! You have to be able to roll with the punches if you are going to survive it! And if not, you can always try something new within the nursing field, isn’t that what nursing is all about? Healthiest habit for workdays: Lots of sleep the night before and even more water through out the day! Go-to meal that I pack for work: Anything with avocados…and coffee!! Favorite thing to do on a day-off: New adventures with friends and family! Compression stockings, compression socks, or neither? COMPRESSION SOCKS! Puke, poop, sputum, IV starts in babies; we’ve all got our aversion, what’s yours? SPUTUM!